Currently Principal First Violin of the Tasmanian Symphony Orchestra, Jennifer has worked professionally as Principal Second Violin of the Houston Symphony (from 1999-2015), previously as Principal First Violin and Acting Associate Concertmaster of the Tasmanian Symphony Orchestra (1996-99) and as Associate Concertmaster of the Richardson Symphony, Texas (1992-93). 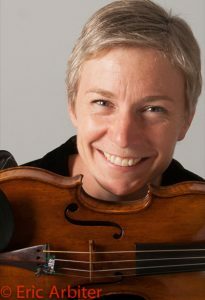 She has performed as Acting Principal First Violin with the Melbourne Symphony and as a member of the second violin section for the last two seasons of the Australian World Orchestra. During her time in the United States she played in many summer music festivals including Santa Fe Opera, Grand Tetons Music Festival, Aspen Music Festival, Bravo! Colorado, Strings in the Mountains, and Park City Music Festival. Jennifer has appeared as soloist with the Tasmanian Symphony, the Houston Symphony and the Riverside Symphony in New York City. As a chamber musician Jennifer has most recently performed with Virtuosi Tasmania and for the 2016 Dark MOFO Festival. In the US she was a regular guest on Faculty chamber concerts at both Rice University and the University of Houston, and appeared on concerts for the Society of Modern Music, and the St Cecilia Chamber Music Series.